It seems that since Dovpo releases the topside squonker mod which adapts an innovative design on the refilling of the bottle, more attention is paid to the redesign the squonker mod. Now, we have Battlestar Squonker kit from Smoant which has a trigger button on the top to refill the RDA which is also a new attempt for the squonk mod. The Battlestar squonker mod is made of the zinc alloy for the mod body and PMMA for the container of the liquid. It has a size with 87.5 x 44.5 x 40.5mm. It is large and heavy in hand for ladies. Looking for the top, it is in the shell shape which is very beautiful in the sense of aesthetic. As a dual 18650, the Battlestar supports max output 200W. The output voltage of the mod is 6.0-8.4v. It has a 0.96 inch OLED display screen. With 2A quick and balanced charging technology, you can recharge it directly with the USD cable. The capacity for the liquid container is 7ml. It supports VW, VV, VW mode with the resistance from 0.05-3.0ohm and TC mode with NI, TI, SS316, TCR supports resistance from 0.05-2.0 ohm. Also, it comes with reverse protection, overheating protection, low voltage protection, short circuit protection, and 10s overtime protection. 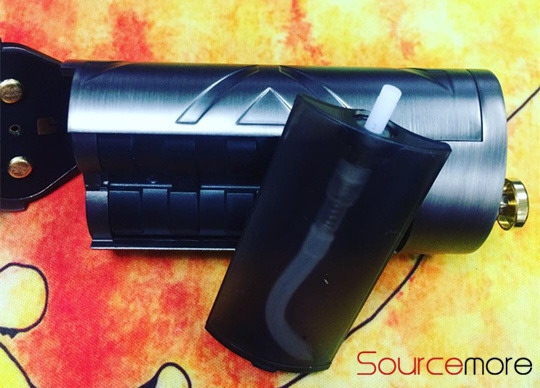 The most important part of the mod is the liquid container and the trigger button. For other parts, it is a typical mod from Smoant which is in high quality and well built. The container comes with a solid one instead of the silicone bottle. The container is a curved shape. If you do not watch it seriously, you would not find it is a liquid container. There is a pipe in it for filling juice to the RDA when pressing the trigger button on the top. Comparing to squeeze the bottle, it is much easy in operation. The refilling hole for the container is on the bottom. You have to remove it from the mod and turn upside down to refilling which is also inconvenient. 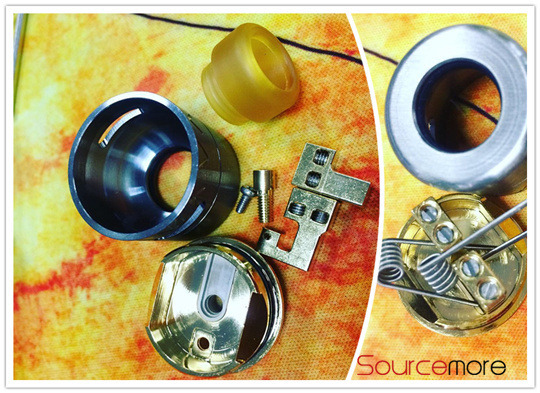 The RDA for the mod is a dual coil one in 24mm diameter. It has a wide and deep deck for more liquid. The side angled airflow control provide you with massive clouds. It is very easy for coil building.